Our home was built in the early 70’s, and I have to say, it’s infrastructure, particularly the foundation, crawl space, attic, septic system, electrical system, plumbing, and HVAC systems, were not well thought-out, executed, or maintained. So far, the only item on that lengthy list that we have not at least substantially addressed, is the foundation. 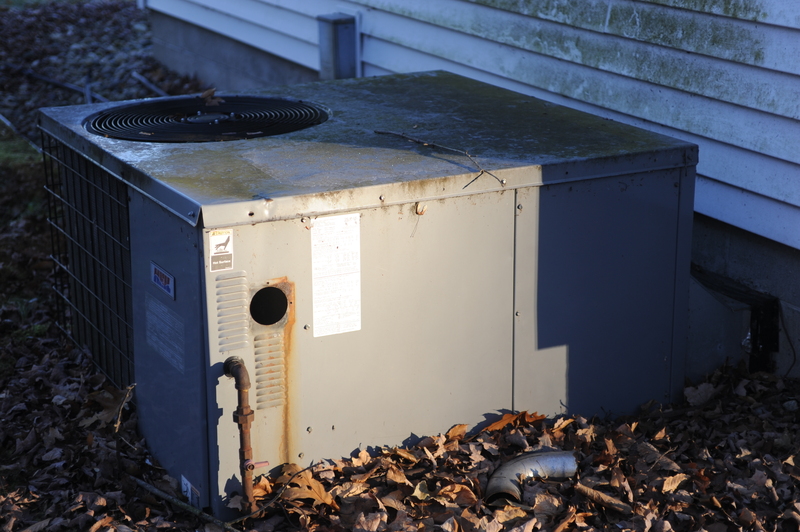 The HVAC (heating, ventilation and air conditioning) was particularly inefficient, unreliable, and costly. Sustainable heat: Not. We inherited from previous owners, an old propane-fired forced air heating system, using two package units (you usually see these used industrially, the entire heating and air conditioning apparatus is outside the house, only ducting and wiring connecting it to the house), with installed electric baseboards as “back-up,” I suppose you could say. The first time the propane-fired forced air system failed, due to operator error I might add, we learned that the electric baseboards were not capable of bringing the house up to even 45°F; they’ve not been energized since. So what have we done, and what are we doing, to improve the sustainability and resilience of a system for providing sustainble heat? Read on for the details. When the first (the unit serving the main house) of two package units failed, which is to say it became so unreliable as to be prohibitively expensive to sustain, we selected a “nook” inside the house as a “utility closet” of sorts, and installed a high-efficiency, though also propane-fired furnace, to replace it. 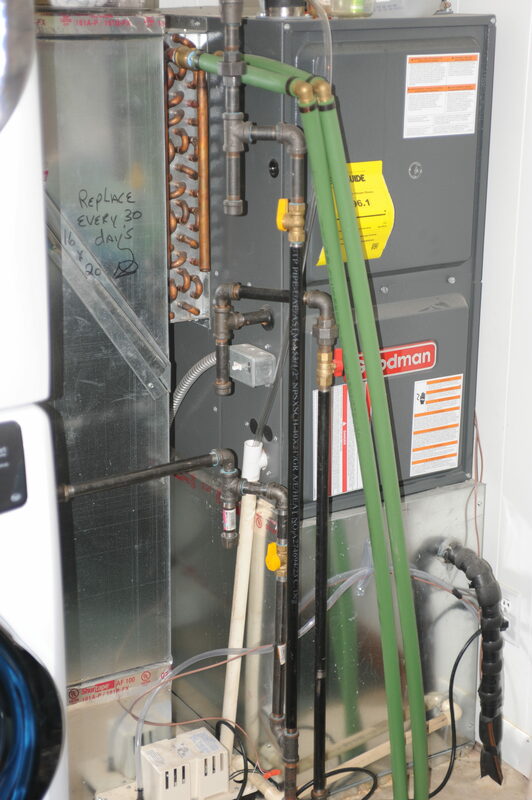 At the same time, having already decided that heating primarily with wood was in our future, we had a water-to-air heat exchanger installed in the return air ducting, which could be then connected to hot water from an outdoor wood boiler. As it turns out, we installed both the new furnance, and the Central Boiler Classic Edge 750 outdoor wood boiler in 2016. You can see a bit about that in the 2016 Year in Review blog post; upgrading the heating systems was one of things that went well in 2016. This year, the second package unit failed, that serving the so-called “Studio.” A week from today we are having hydronic (water) baseboards installed in that room, which will be connected to the existing outdoor wood boiler systems; the second of two package units having failed this past spring. 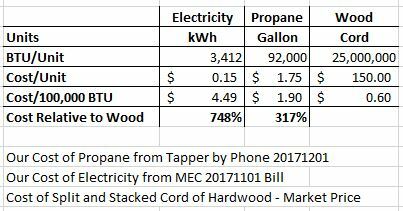 To complete the un-sustainable heat picture, the cost of both electricity and propane, let’s face it, in large part both derive energy from fossil fuels, are also unsustainable. I’ve said it before, I’ll say it again, since the humble tree, and in the face of all of our technological “progress,” a more cost effective, efficient and sustainable way of storing carbon has not been developed. We live in 65 acres of woods, it’s a no-brainer. The house leaks a lot of energy too, through such things as windows, which are large and numerous, and many single pane, bathroom ventilation, and the microwave and dryer exhausts. The bathroom vents and microwave and dryer exhausts are basically chimneys, without dampers. Think about that. I wrote some on what we have done to tighten up the house in the blog posts Winter 2014/2015 – Work in the Woods, Hunting, and Planning, and Insulating Can Lights: The Rest of the Story. There is almost no end to the potential improvements possible. What does this mean to me? Well, we live in the woods, experience has shown we are 30 minutes from first responders; so safety is an important factor. Having the wood furnance outside, 125 feet from any structures, is the safest way to burn wood for heat that I’m aware of. And the cleanest. Next up, the system, in it’s entirety, must not fail to produce the necessary heat. Let’s just say that living in this climate without heat would be a tad uncomfortable, at best. There must be at least one back-up to the primary source, and preferably a back-up to the back-up; “2 is 1 and 1 is none,” as the old saying goes. 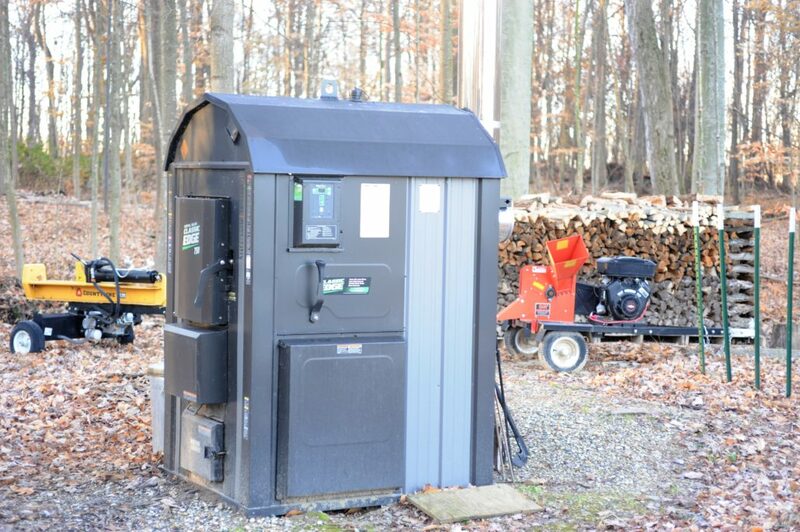 As our secondary source of heat producing energy, we have propane to back-up the wood. The Achilles’ Heal of this current arrangement, is electricity; the electricity needed to power control systems, pumps (for the boiler water system), and fans. Our grid power comes in on poles, through the woods, and is very susceptible to damage, especially in winter of course, with high straight-line winds. We have temporary electricity back-up available, a back-up generator, which will supply power for one to two weeks; that should cover 99.9% of grid-down situations. As a back-up to the back-up generator, eventually we will install a solar system capable of providing the necessary electricity indefintely. As a back-up to those back-ups, and something that will potentially be installed before the solar system, is a passive wood-fired heat source in the house. Passive, as in a heat source that requires no inputs other than wood; think wood cook stove or straight-up wood stove, perhaps a wood stove insert for the existing fireplace. My ultimate goal is that heat can be indefinitely produced, independent of the grid, from resources we have at hand. That’s resiliant. Today is the day! Last year I started the boiler Nov 07, and there was too little heat load to keep fires burning; I had to restart the boiler several times in the first few weeks. This year I set Thanksgiving as the date, but our weather was unseasonbly warm. Now, it looks good. 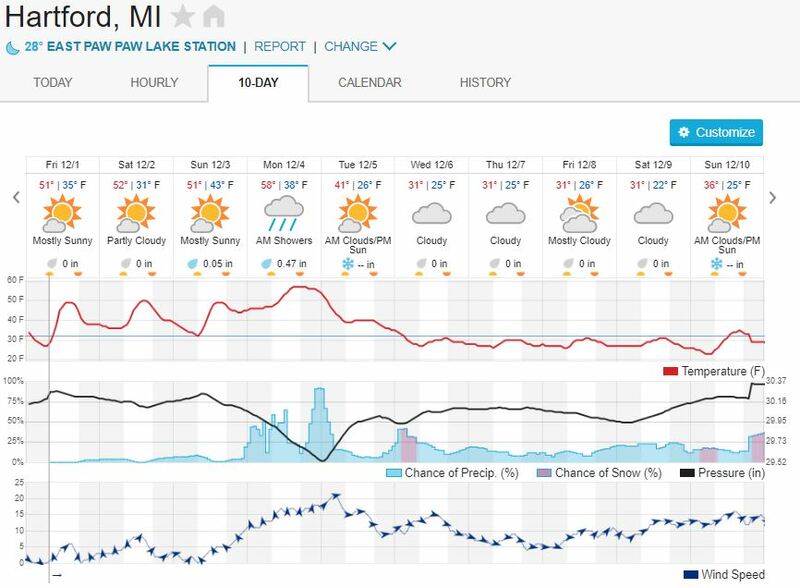 In the 10-day forecast it looks like cool weather is on the way, hopefully to stay. This should be a lot less of production than last year, which I documented in YouTube videos on the subject. The chief reason is that I have learned from experience, a secondary reason is that I’ll be cheating. Ha! You’ll have watch the video to find out how I’m cheating! Great stuff John! Timeline for completion of the solar? Thanks David! No time table on the solar. Frankly, I’d rather have the “passive” solution in place first; that would be the most robust and simplest back-up. Probably a fireplace insert; I don’t think we are up to cooking on a woodstove just yet!